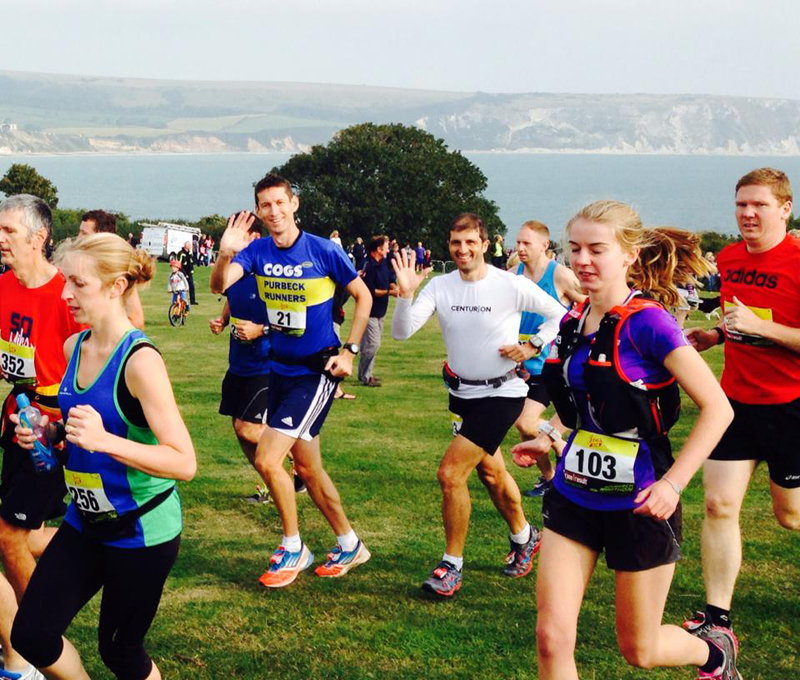 The Purbeck Marathon describes itself as one of the World’s Most Scenic Marathon. 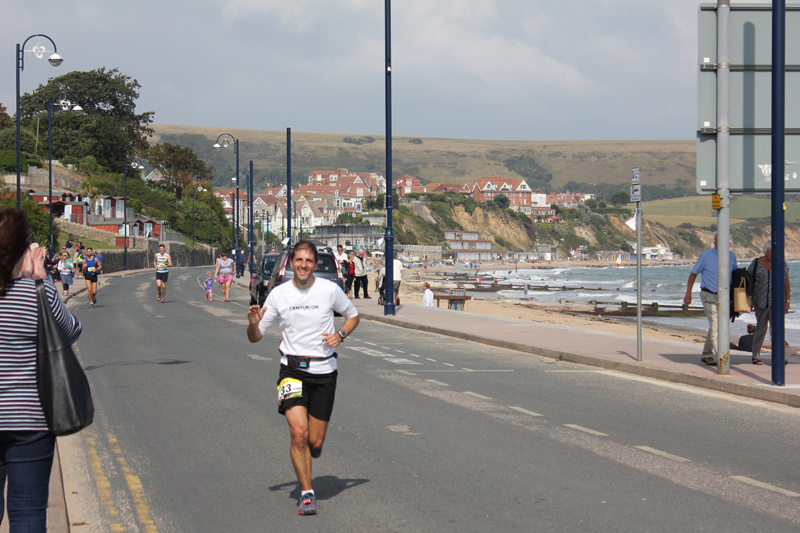 The event starts and finishes at Swanage on the south coast and the route follows an oval shaped out along the Jurassic Coast through Kingston towards Swyre Head and along the ridge to Tyneham Cap. 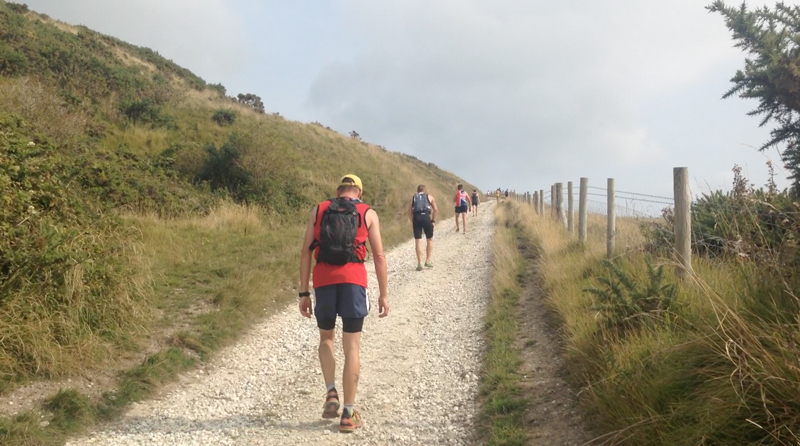 The route than leaves the coastal path and runs through Tyneham and up and along the ridge of Purbeck Hills towards Corfe Castle and returns back to Swanage finishing on the seafront. The event is an off-road run and described as a challenging run with 3000+ feet of elevation. In addition, the marathon is acknowledged as being just over the 26.2 mile distance (by half a mile at the most) so you could technically class it as an ultra. 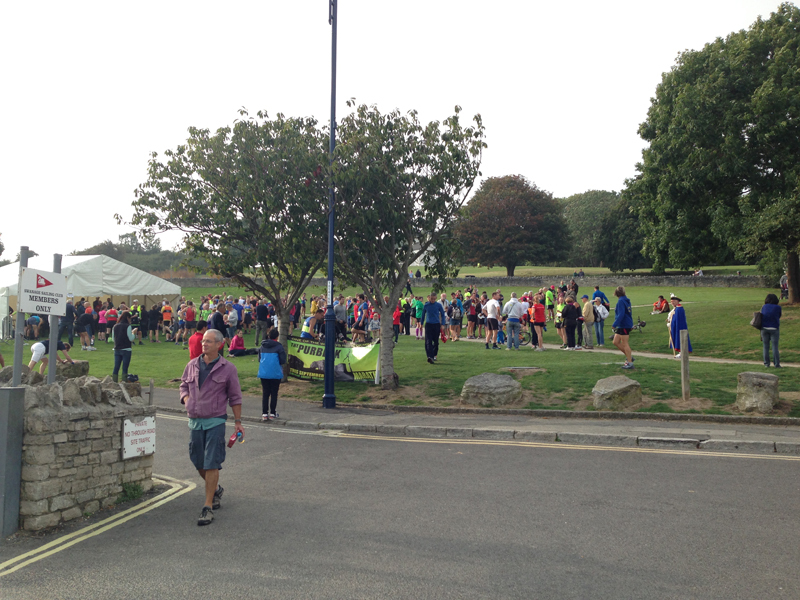 I had the event in my diary for some time as one of my running buddies Matt had relocated to Swanage last year and I had agreed to pay him a visit and do the event. In terms of where this fitted into my running calendar, I am currently building up towards the Winter 100 in 5 weeks and this was planned as a social/training run. With the hilly nature of the course, I was going to get a good workout so it was one of those events that you pitch at a 90% effort. 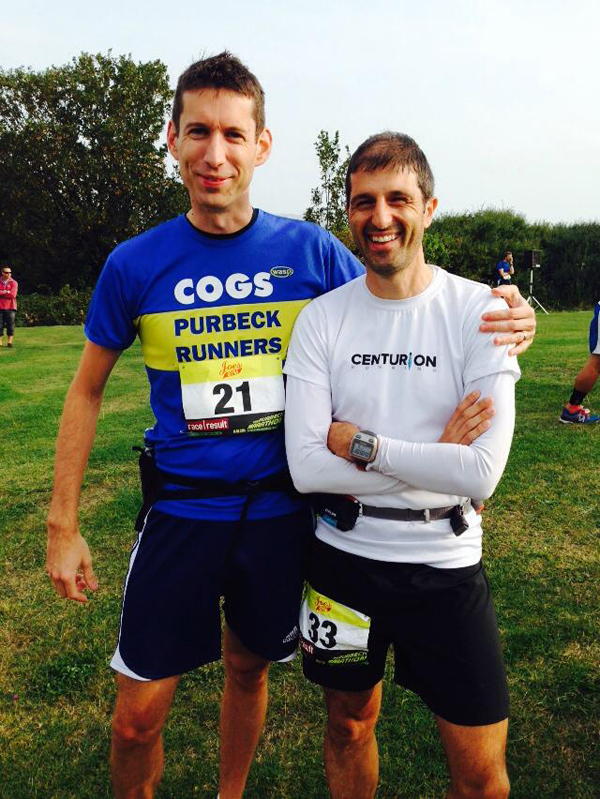 After a very early start and a couple of hour drive from Reading, I met Matt and we arrived at the start. Matt had already registered us so the night before and had plenty of time before the start of the race. We grabbed a few photos and then made our way up a small hill to the start of the race and listened to the fairly lengthy race briefing of which the key points I recall were don’t wear iPods, listen to the marshals instruction when crossing the railway line and something about a firing range and not straying off course. The weather was starting to look really nice with the early morning cloud cover starting to disperse and the sun shining through although I was expecting a bit of a breeze on the coast. Matt mentioned the first few miles follows a narrow coastal path with limited overtaking potential and it was prudent to line up close to the group of people similar to your own running ability so as not to be caught behind steadier runners (or cause a traffic jam for quicker runners) and we positioned ourselves “upper mid-pack”. 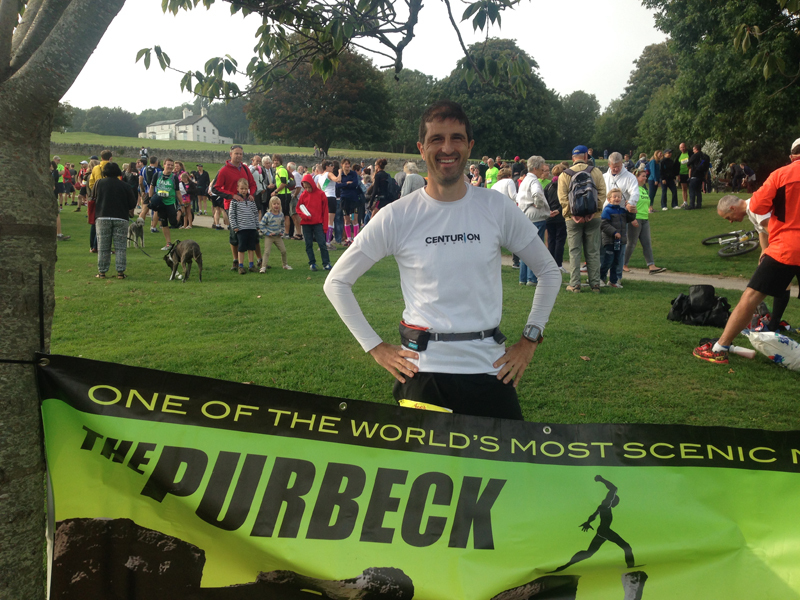 Matt had run 4.32 the previous year in one of his first marathons and was aiming for around 4.15 this year. I didn’t really have a time goal or plan for this one as I wasn’t sure how this would compare to a flat road marathon and we decided to run together and see how it went which would give us a chance to chat and catch up. 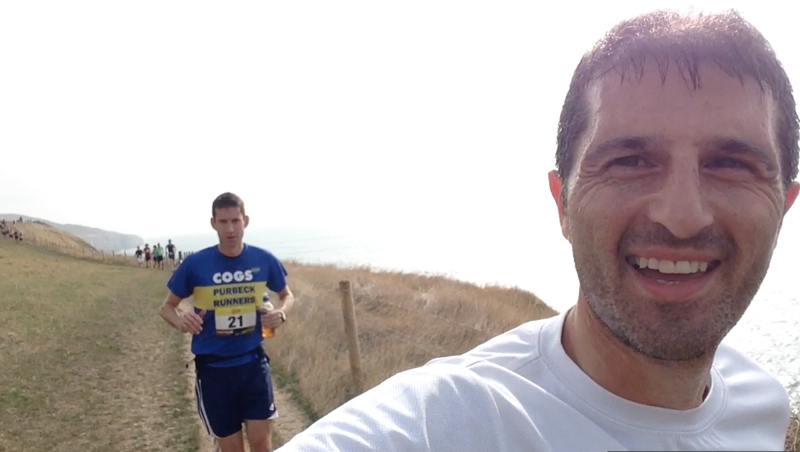 The race started and we headed off up a hill and then along a country lane towards the coastal path. After the first mile or so I needed a comfort break and Matt ran on ahead and I gradually caught him up afterwards. We hit the narrow stony path along the coast taking care to not trip (although I nearly stumbled once but caught myself in time). The weather was warming up and to be honest we over-cooked the first few miles. The pace is difficult to judge as we were leaping over stones and rocks heading up and down the path but I was feeling too hot in my baselayer and I had a full head sweat as the back of my head was dripping with sweat. It was almost a relief after the first few miles where there was a long uphill section which people were approaching with a mix of running and walking and I used this as an excuse to take an s-cap and energy gel as I rested my legs for several precious seconds. We settled back into a trot and head down a country lane past a few supporters and marshals and then back onto an off-road part of the route. Course navigation was pretty straightforward with marshals placed at every turn, some grass markings, mile markers and arrow signs placed around the course. In fact, the marshals were excellent and definitely added something to the event with their support and assistance. 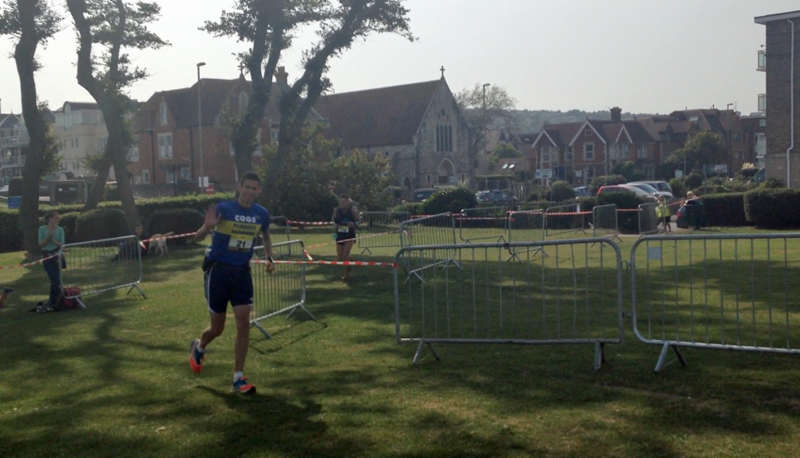 It definitely felt like it was a real community effort getting the marathon organised which was confirmed as (local boy) Matt said hello and spoke to several marshals and supporters on the course. We were clocking around 8m/m – 9m/m pace for the first half which varied depending upon the footing and elevation. I did regret wearing my Mizuno Wave Hayate ( a lightweight trail shoe) as this didn’t give me enough cushioning underneath my feet and the toe-box protection was poor as I winced as I kicked a few stones and could feel a blister forming on the ball of my left foot. As the weather had been good and the ground was firm I could have worn road shoes with a bit more cushioning. There wasn’t much I could do about it now and would just have to accept this little bit of discomfort for the remainder of the race. Around the 10 – 11 mile point I started to drift a little ahead of Matt and eased off a little bit to grab a few photos and video (will upload separately) as Matt caught me up. 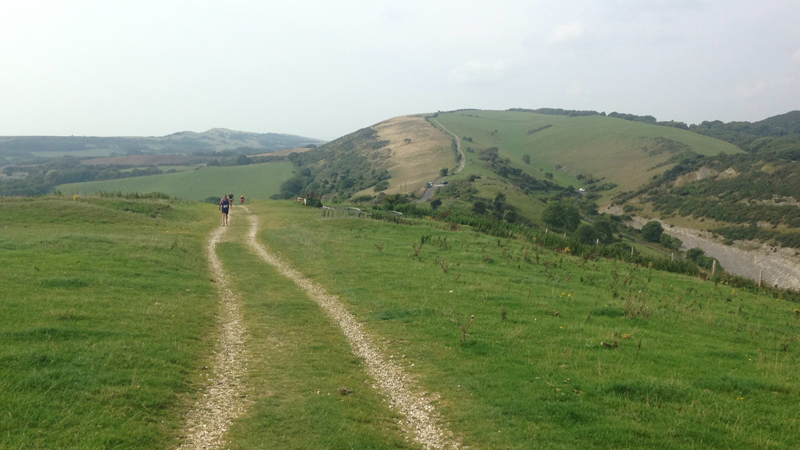 The views around the course were stunning with a clear day giving you some fantastic views of the south coast on the out leg and some lovely views of undulating hills and fields on the return leg (much like the South Downs). There was a steep hill at 12 miles’ish which I pushed past the “ultra” thought of walking the hills and was quietly proud that I ran (most) of this bit. I got to the half-way point in about 1.55 and passed a walker who was counting out positions as he told me I was 51st. Unfortunately, I had drifted ahead of Matt and turned around but couldn’t see him and decided to just carry on out my own pace now marking the end of the “social” aspect of the run and now had the second half and the “training” aspect of the run to see through. At mile 16 was the “killer” hill, one long steep rise which I used as an opportunity to eat some shot-blocks, drink and take another s-cap. 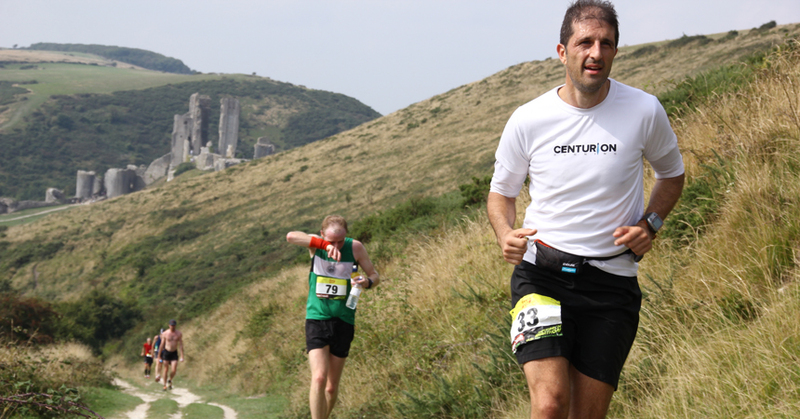 At the top of the hill you followed a ridge which headed past Corfe Castle and back to Swanage. 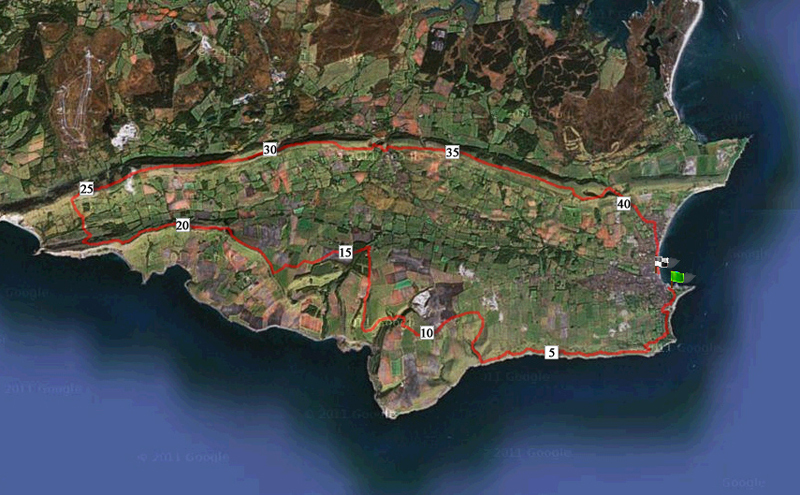 The next few miles were simply a head down and plod on phase. I periodically spoke to one or two people but carried on at my own pace. As we headed towards a checkpoint around 19 miles, I spotted a runner ahead in some discomfort and spoke to him briefly. He mentioned he was suffering with cramp which wasn’t a surprise as it was a really warm day. Luckily, I had one s-cap left on me (which I had planned to take at mile 20) but gave it to the runner as he needed it more than me. I did see him finish at the end not too far behind me so he seemed to recover ok.
Around mile 20 I also saw Chris Edmonds out walking his dogs sporting the same Centurion T-Shirt I had been wearing and after a quick hello I trotted off. I do recall another long climb around mile 22 which was a bit of a tease as you couldn’t see the top and it seemed to rise, flatten, rise again. I started to hike up this ascent and asked the guy next to me how long this climb was and he said about 2 miles and so I broke into a slow run. On the basis that during the second half of the race you are running with people of your own ability, I did observe that my uphill running wasn’t as bad as I had imagined (but not great at all) as I was passing a few people (albeit slowly) on the up hill sections. However, it’s fair to say that my downhill running wasn’t so great with some people having the confidence to let loose and fly down the hills where I was gingerly picking my steps and trying not to let momentum carry me too far forward so something to work on for future runs. I glanced at my Garmin trying to work out my finish time. If I kept this pace going I would be around the 4hr mark although with an extra half a mile or so on-top of the standard marathon distance this wasn’t quite guaranteed. With a few miles to go, it was simply a case of ticking off the miles and keeping the run going. 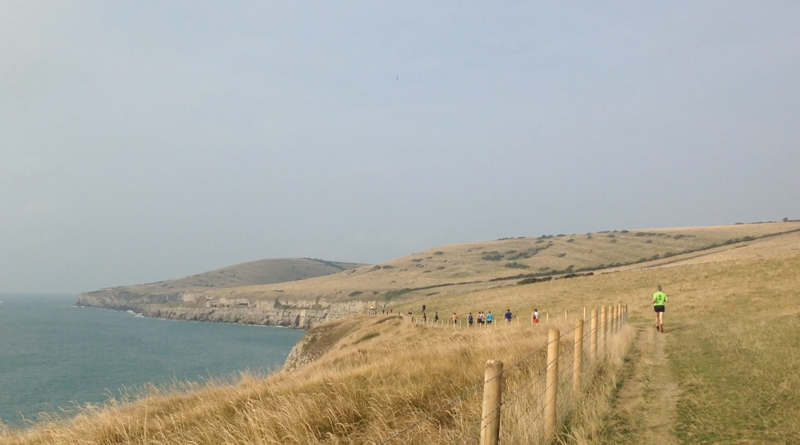 I had drifted past a few runners but there weren’t that many people within sight and I could see Swanage ahead as I came off the trail and onto the roads into the town. As the route levelled out, I started to grind out the last few miles driven partially by the desire to now finish with a 3.5x something on the clock passing the numerous marshals who were on hand to direct all the runners around the course. I spotted the beachfront and ran along the beach passing a couple of guys quite near the end before making the sharp right hand turn and last few yards to the finish. I crossed the line in 3.56 positioned 29th out of 323 finishers and was pretty pleased with the workout and having rather enjoyed the run. My Garmin read 26.77 miles so the half a mile over a marathon distance was an accurate estimate. At the end of the race I was given a medal, a sling bag style goody bag which included a few items, some water and a pot of ice-cream which went down rather well. I got changed as I was parked nearby and then headed back to the finish to catch up with Matt’s family, had a burger and chips and waited for Matt to finish which he did in 4.32. 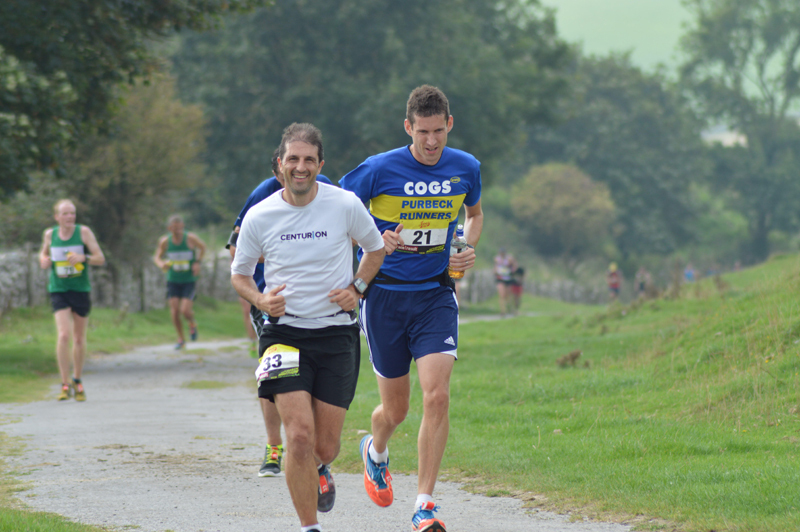 Unfortunately he suffered a serious bout of cramp at miles 17-18 which slowed his progress in the last few miles. The run was a little challenging with over 3,000 feet of elevation and it was a hot day but it was a great workout and an enjoyable, well supported and well marshalled event. I would definitely recommend it to people who are looking for a nice challenging marathon run and not worried about a PB time. 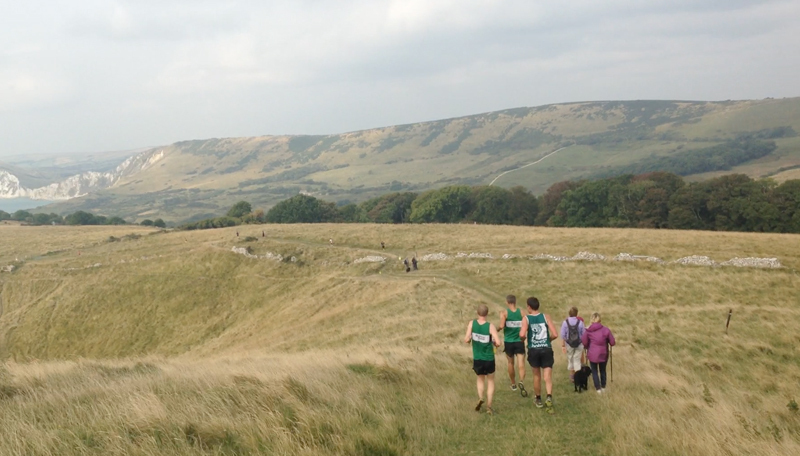 Despite a long drive there and back, it was a good day out at a well organised race. This seemed like an appropriately difficult workout — scenic and challenging without really grinding you to a pulp. Best of luck with the five weeks you have ahead of you. I can’t imagine the kind of stamina and fortitude necessary (in your legs, mind and stomach) to tackle such a distance, so all the best in the lead-up.